Along the way and if you live long enough, the body wears out. When that happens, we get to interact with the health care system. Instead of pretending those circumstances are not going to occur, how can we prepare for the eventuality? Especially with older patients or if you have a chronic condition, coordination of care is important. You should designate someone to help oversee your medical care; usually a friend or family member you identify as your health care proxy and advocate. A primary care doctor usually is gatekeeper to the health system; advising on preventive steps and diagnostic tests and making referrals when a specialist is appropriate. If you enter the realm of needing specialty care, you may encounter some tunnel vision. While seeking care for my back, I experienced the hyper-specialization of medicine. At the first orthopedics office I was directed to, after turning in the lengthy medical history, I learned they handled joints like knees and hips, not spines. The next referral sent me to a hospital five hours away to see a neurosurgeon. During the consultation, I learned his specialty was brain tumors, not spines. Ultimately, I connected with a spine surgeon who understood the issue and was able to treat it. Be a conscious consumer of health care. Prepare your index card with questions ahead of your appointment. What is your goal for this visit? Give a status report (symptoms, how long, how intense), if you are presenting with a health issue. Take notes during the examination. When the doctor concludes, do you have your next steps written down? Do you need to go to the lab or get scanned? (My friend, Sandy, advised to always ask for a DVD of x-rays, even though the radiologist’s report will come after review.) 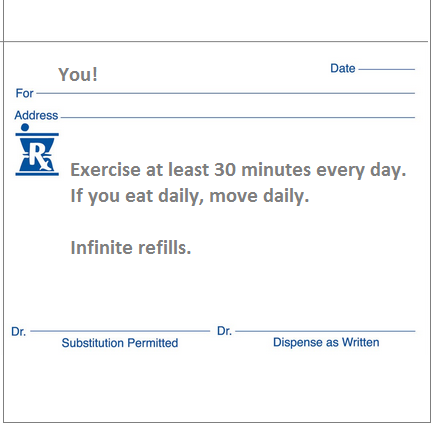 Is there a prescription involved? When we are in pain or taking certain medications, we may not be as clear-headed as usual. In that case, bring someone to the appointment with you. Plus, if you had a health issue that compromised your cognition, how did you get to the appointment anyway? Obesity is a looming crisis, raising concerns about the health and economic consequences that result from its complications. Being overweight is a risk factor for diseases such as diabetes, heart disease, stroke, cancer, and arthritis, leading to human suffering and imposing significant medical costs. In the US, unintentional and violence-related injuries, accounted for 59% of all deaths for people up to age 44; more than from disease. Having worked in a hospital, there are many and varied ways that people end up needing medical treatment. Take charge of your health, using doctors as consultants. Treat your body as a temple. Get to know your physical weak link. Practice preventive care. Balance input (eating) and output (exertion) to keep your body operating optimally. Walk more. Play more. Spend time each day outside. The life you save may be your own. Live long and prosper. June 2, 2015 in Body, Health. ← We all need a little help from our friends– especially in the hospital!